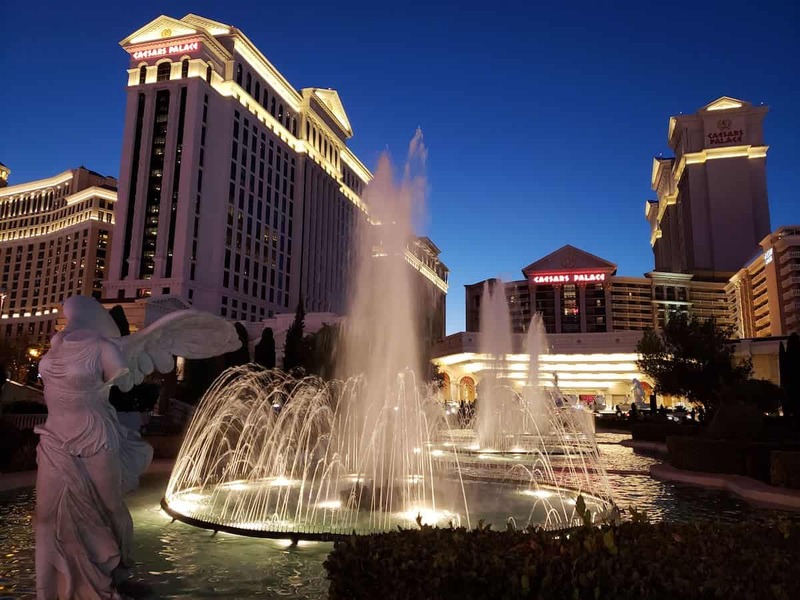 Back in May, I purchased the 2-Night VIP Getaway at Caesars Palace for $450 as part of the annual Daily Getaways promotion from the US Travel Association. I tend to be an M life guy with it comes to Las Vegas, but figured it would be fun to give Caesars a try for once. 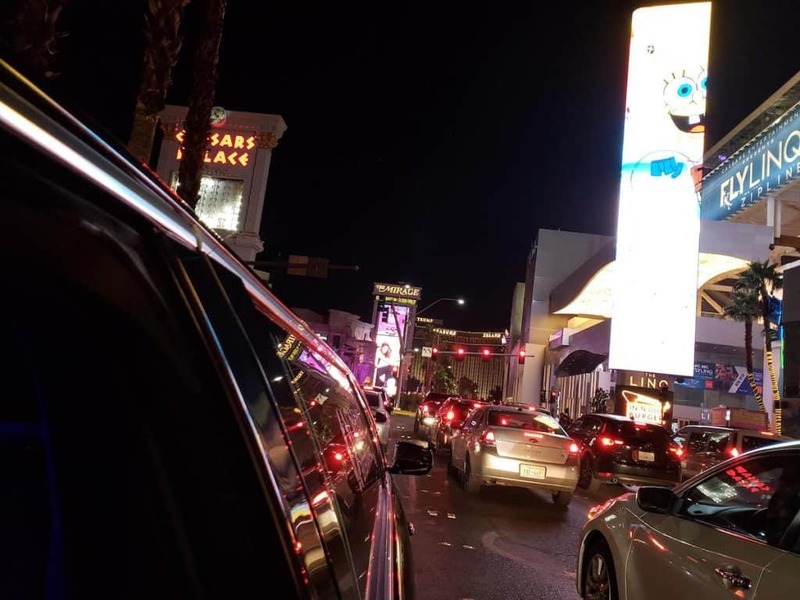 The deal I purchased included two nights at Caesars Palace (including resort fee), limo transfer from/to the airport, two Buffet of Buffets passes, and gym access. 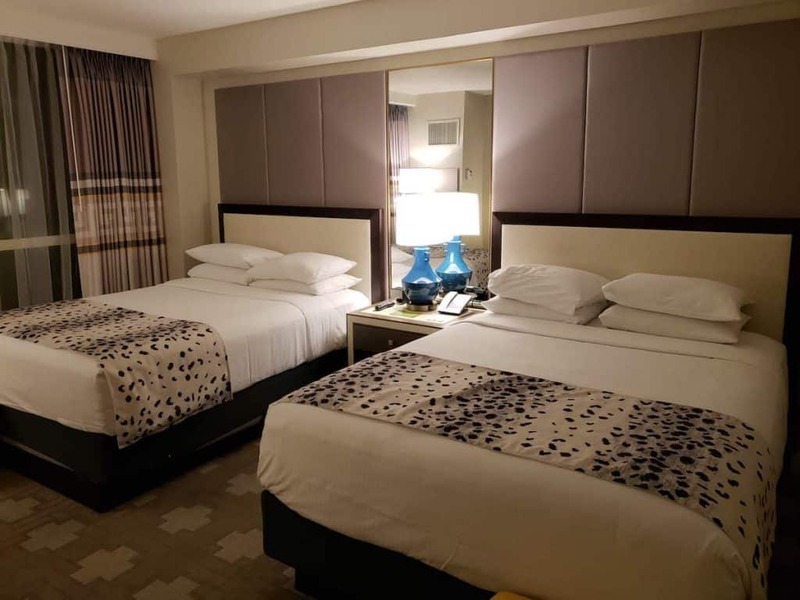 In addition, I was able to status match to Total Rewards Diamond for extra benefits during the stay. A few days after purchasing the package, I received an email from Caesars with the redemption certificates. I had about 13 months to use the package and had to reserve at least 30 days prior to the visit. I wanted to stay over Veterans Day weekend. I completed the form, scanned it in, and emailed a copy to the supplied email address. 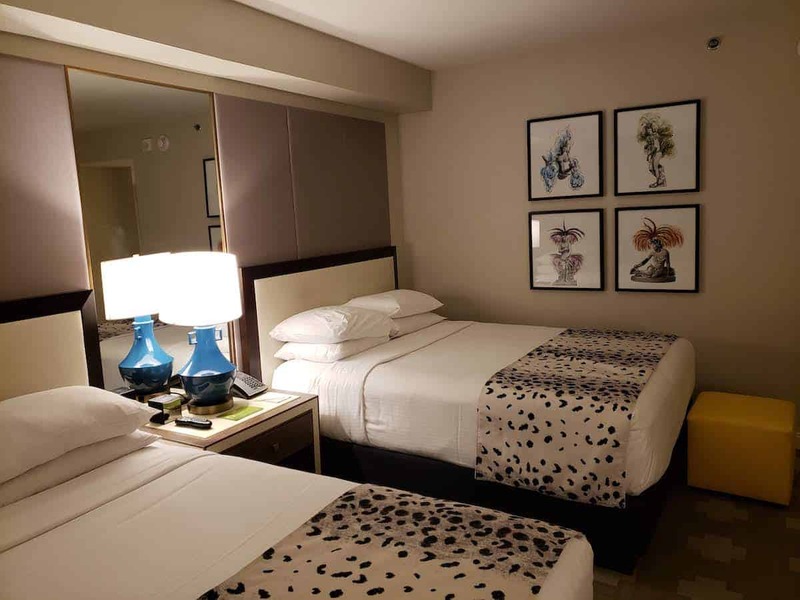 Soon after I received confirmation for two queen bed room for Friday and Saturday night. I invited a friend on the trip so wanted confirmation of two beds. My flight info was requested for the limo reservation. I was staying a third night in Vegas at Bellagio, so I only was able to reserve the limo for airport pick up. Upon arriving at the airport, after a few minutes we were able to find the limo driver near the baggage claim. 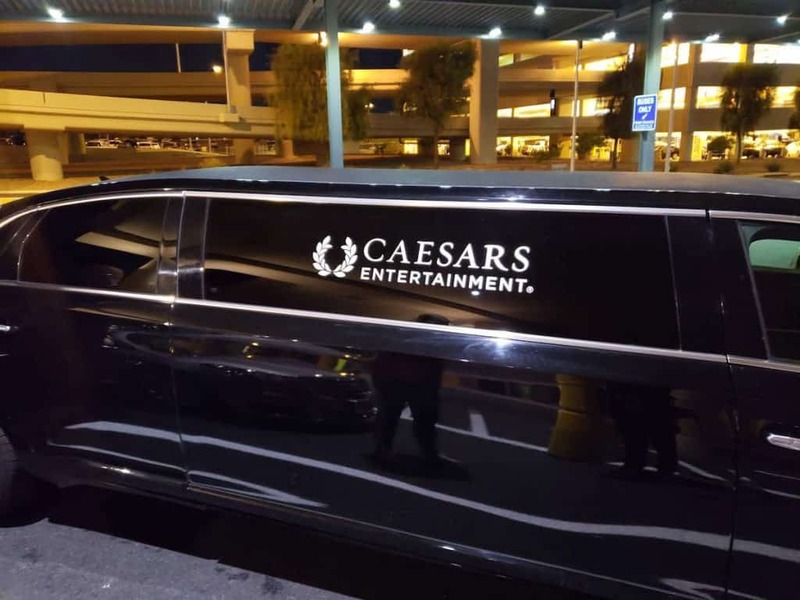 The Caesars Limo was parked across from the tax stand and we were off to the hotel. The inside was nice; with TVs, radio and various lighting options. Water bottles were provided but no other drinks or snacks. 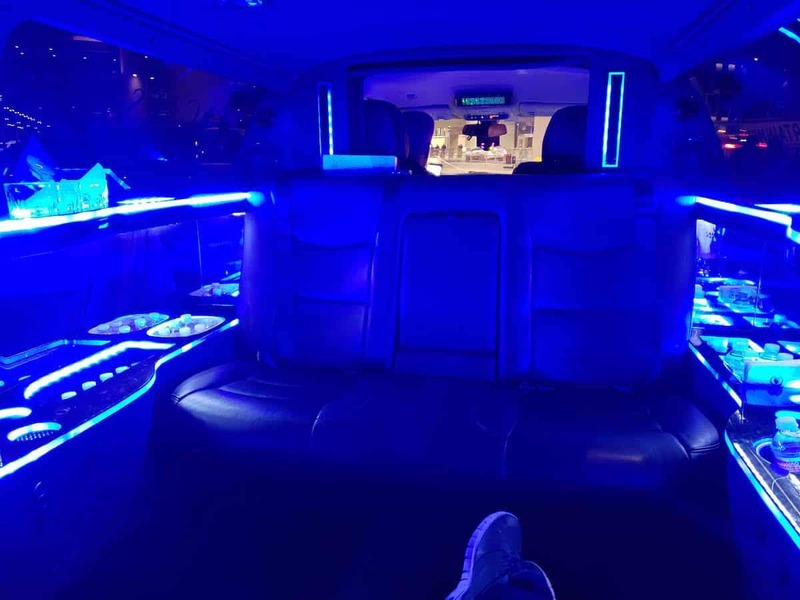 A round trip limo ride would typically run about $120. Although it was fun to ride in a limo, it was a quick ride and I wouldn’t value it at much more than an Uber. I would value the ride at $25 (or $50 for round trip). Since I had Total Rewards Diamond status, we were able to check in at the Diamond VIP check-in lounge. The check-in staff was confused about the package and had me go print off the certificate at a computer station nearby. The room was confirmed but they weren’t sure about the buffet portion. We were assigned room 855 in the Julius Tower. The 14-story Julius Tower is the original hotel tower at Caesars Palace, opening in 1966. However the interior was completely renovated in 2015. 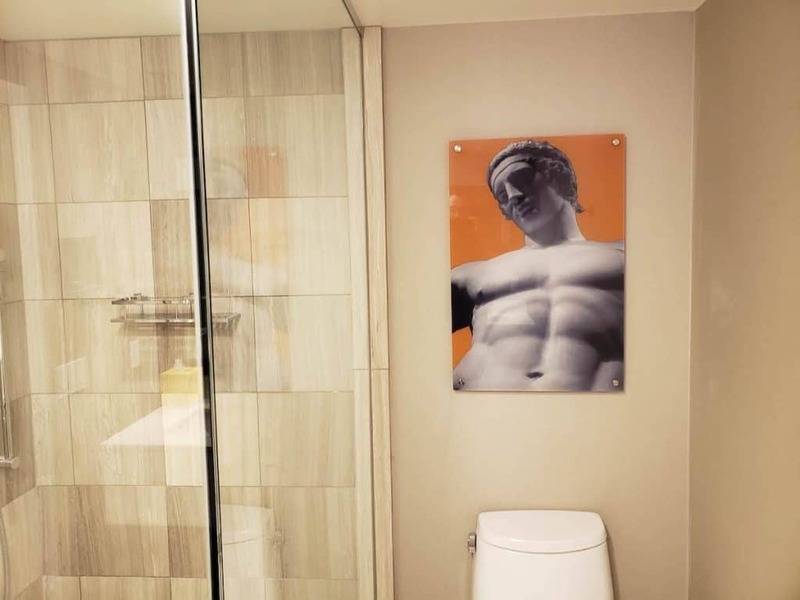 As you enter the room, the bathroom is on the right. A small marble foyer has a closet before entering into the main area. 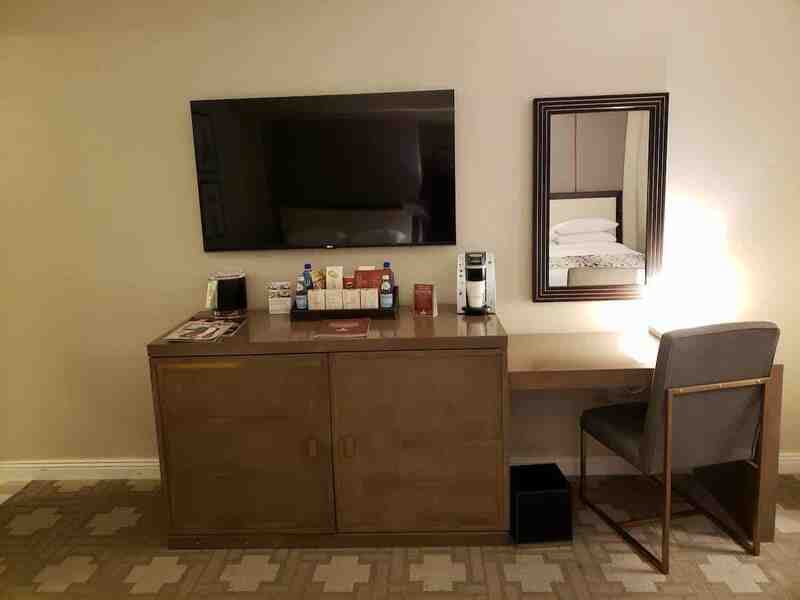 In addition to the two queen beds, there is a small desk, TV and mini-bar. Coffee maker is available but you have to purchase the coffee from the mini-bar. While the room isn’t particularly large, it feels modern and high end. 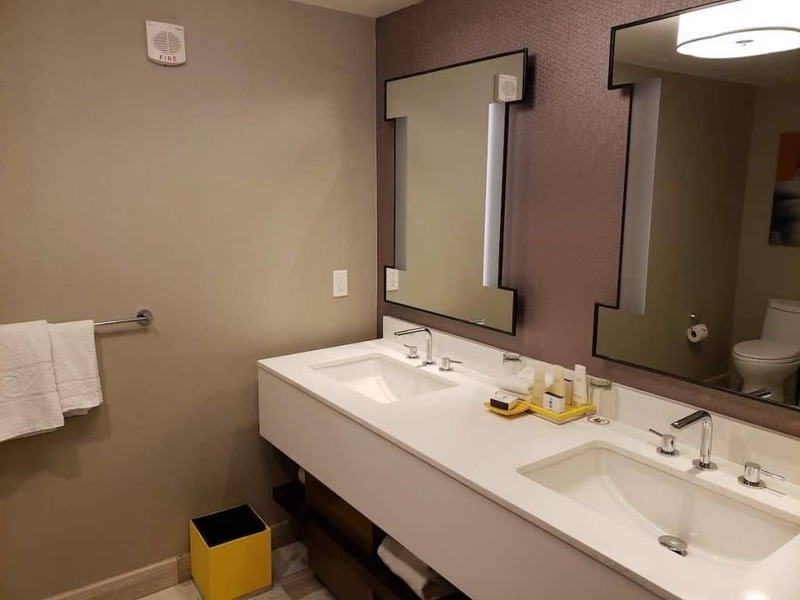 The bathroom is bright and large. Double vanity with lighted mirrors are along one side. 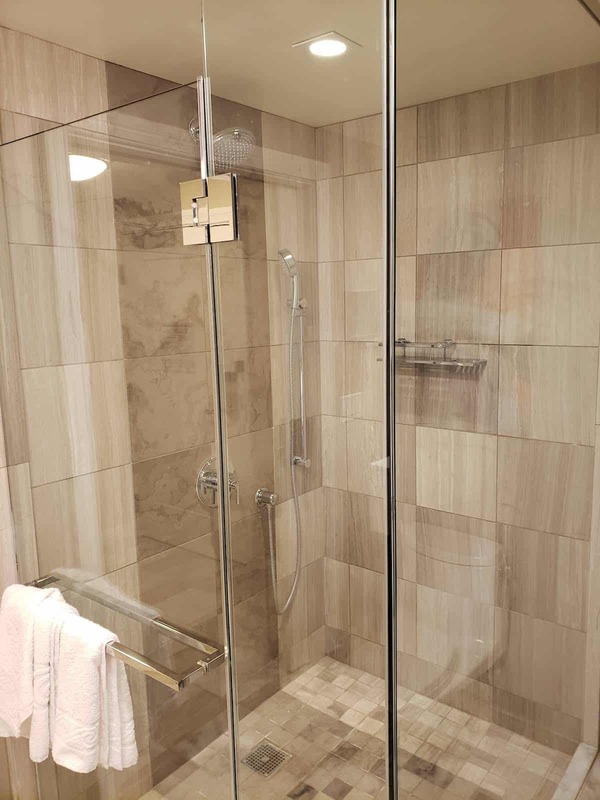 Opposite the sinks is a large shower with both rain shower head and handheld wand. It is a one or the other shower, you can’t have both shower heads on at the same time. There is no tub. 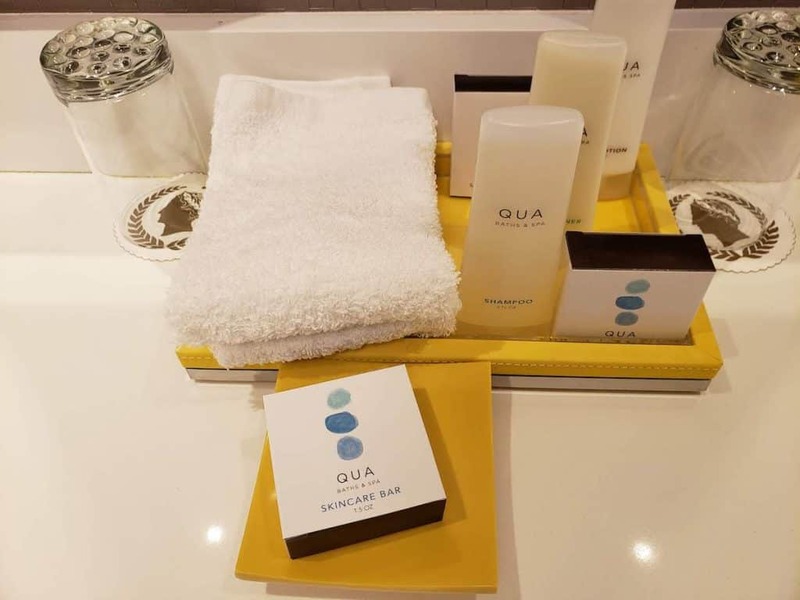 The bathroom products are Caesars’ Qua Spa brand. They were standard, low quality hotel products. The prices for the same room were going for about $260 per night (including resort fee) for the dates of our stay. I am sure you could get better value during an especially busy time, though the certificate warns that the hotel has the right to blackout certain dates. I also don’t value hotels in Vegas as high as their list prices as it is easy to find deals or even comped rooms if you are a regular. For someone that is not a regular to Las Vegas, I think valuing the hotel portion of the package at $400 is reasonable. For myself, I would value it at $250 or so considering no resort fees and ability to reserve it even when comp nights aren’t available. 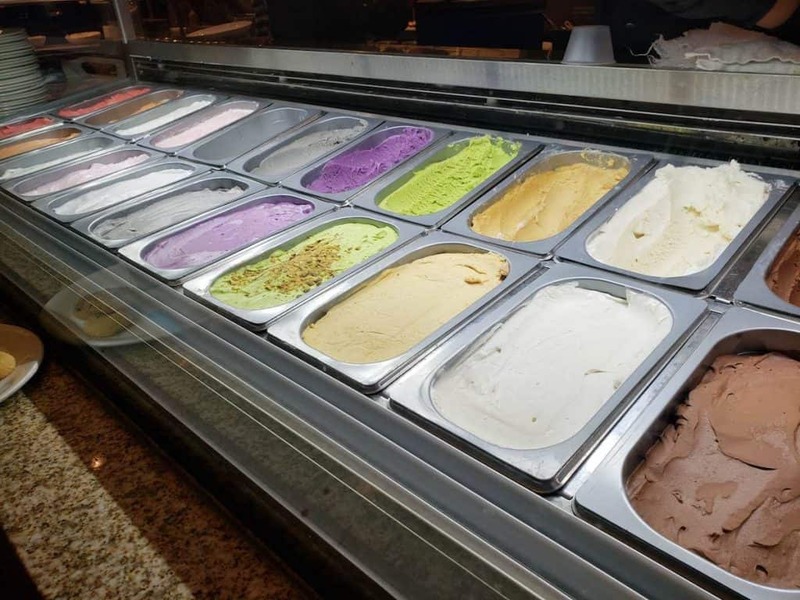 Caesars offers the disgustingly wonderful Buffet of Buffets pass that allows you to visit any Caesars property buffet for 24 hours. The standard cost is $74.99 per person on weekends ($59.99 on weekdays). If you are a Total Rewards member (which is free), you get $10 off. In addition, there is a $25-$35 surcharge for visits to the Caesars Palace buffet. We started at the Caeasars Palace buffet for brunch around 10:00am on Saturday morning. Since we weren’t sure if future surcharges for the location would be covered with our package, we thought it best to start there. The total for the two of us was $194. I don’t think I would ever pay $100 to spend 24 hours eating at buffets. With that said, we did enjoy making the most of it with progressive eating around Las Vegas. We hit up every buffet on the list except Harrah’s. Brunch at Caesars was definitely the highlight, though dinner at Rio was pretty good too. 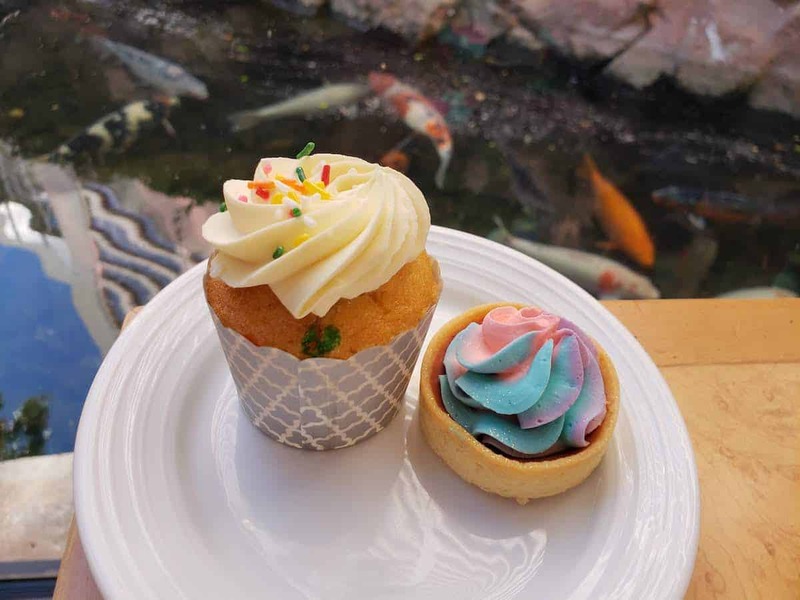 We visited the Flamingo buffet at 9:30am on Sunday morning so essentially where able to get four meals worth out of the package. Also included with the package is access to the gym and free wifi for one device. The gym does not include access to the spa. Gym and wifi is already included for all guests so not sure why this is an advertised benefit. 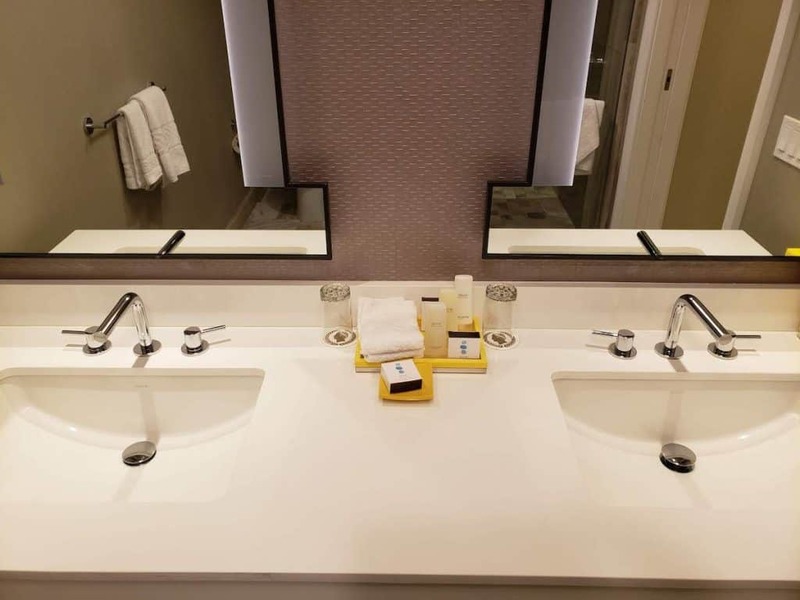 I felt I got my moneys worth from the Daily Getaways package, however I would not say I found it to be an extraordinary deal. If you gamble a bit in Vegas, you will probably already receive comped deals that are as good as this offer. I think the ideal customer of a deal like this is someone that is not a Vegas regular that wants to experience a weekend in Sin City. And that is probably their target customer — getting someone to stay at their property that might not otherwise visit.